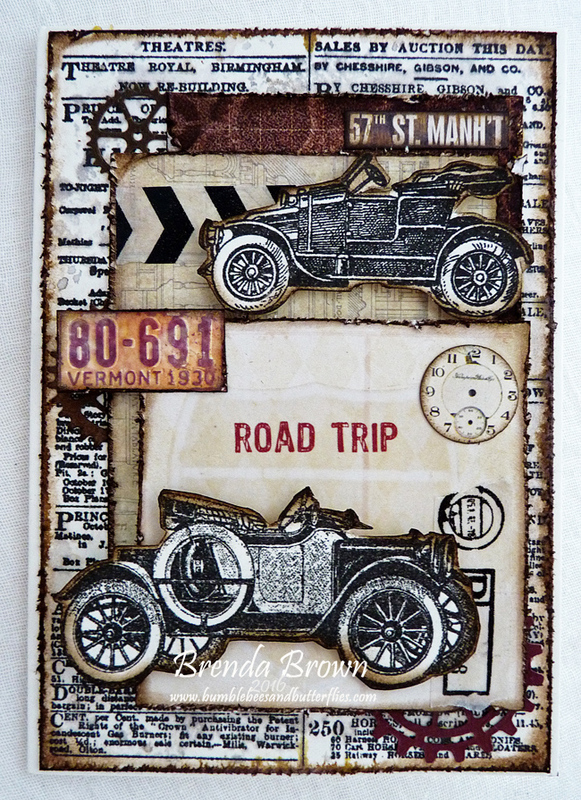 I got the new TH vintage cars stamps recently and lo and behold a couple of days later the amazing Pamellia from My Little Craft Things posted a fabulous shabby vintage car card which totally inspired and motivated me to get my stamps inked up straight away. I stamped the whole set and the new newsprint background not quite sure where I was gonna go with this one but after watching Pamellia's video I knew I wanted dimensional layers. 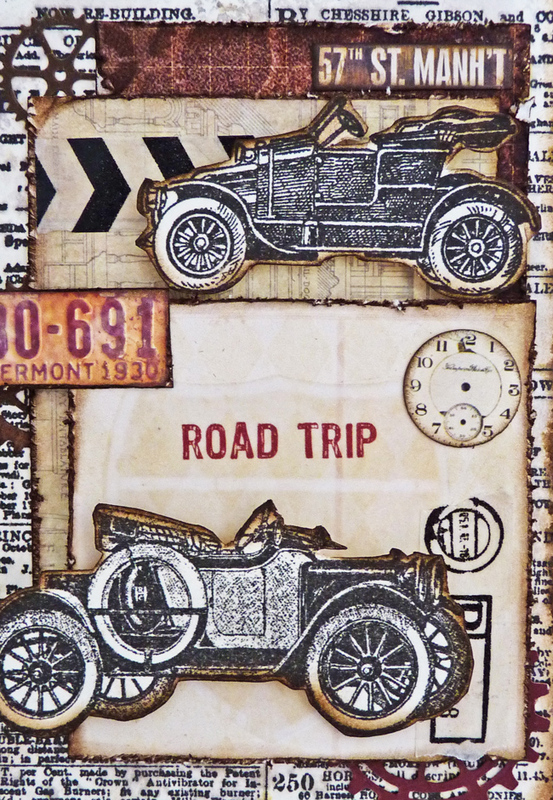 I love the new vintage designs but once I was into the card making process I realised all the cars faced the same way which is a little disappointing when trying to create interest, so I got out an old Crafty Individuals stamp and used that too. I was also inspired by my great friend Astrid who the very same day had a post about using up 'old stock' that has collected in the craft room and not been used, so out came some old paper stacks. 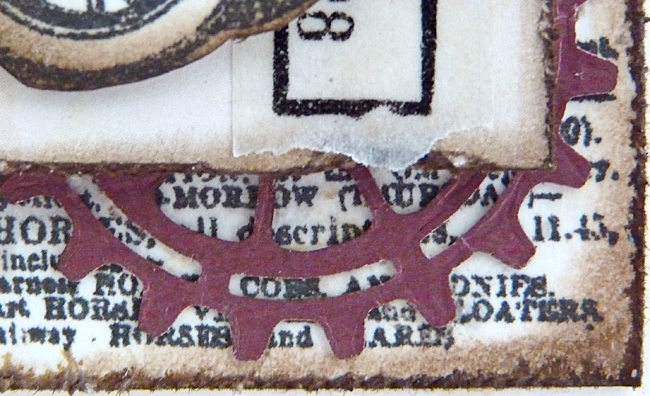 ... and some washi tape build the collaged and dimensional look. 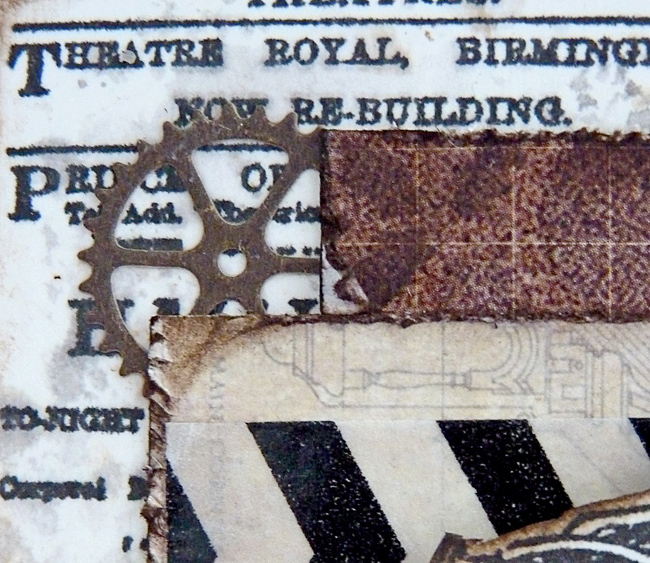 The background has been dipped in pumice stone DI and all of the papers have distressed edges inked with ground espresso. I quite like the look and the effects and huge thanks to Pamellia and Astrid for inspiring me and helping me get my mojo back. I always appreciate your visit thank you for taking the time to stop by. Fabulous as always, Brenda ! 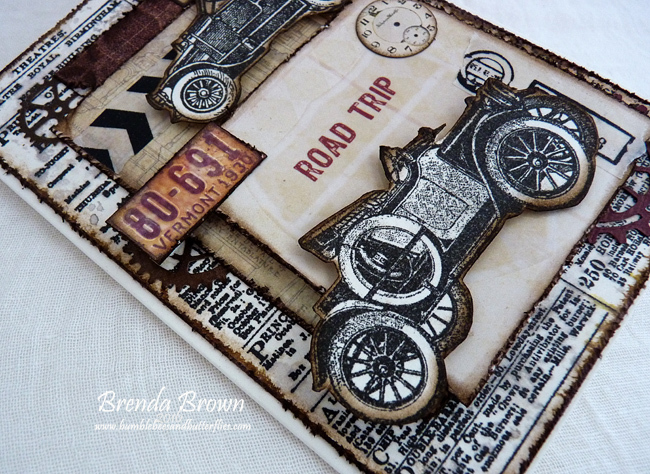 Fabulous masculine card Brenda, loving your paper choice against your vintage cars. Wonderful card, Brenda! Love how everything works so well together. Fabulous Brenda Terrific showcasing of the two new stamp sets and a great example of how t use all those left over bits ( though yours look much better than left overs ) . Love all the layers and the really vintage feel . A fabulous card Brenda, love all the layers and there's so many interesting details. Very handsome! Love that you used up old pieces with your new stamps! 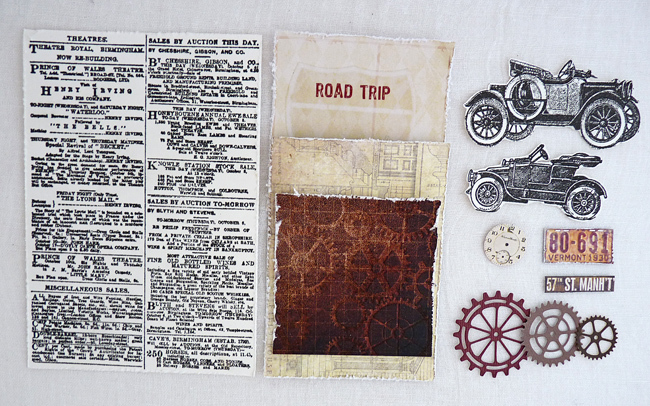 Very, very cool vintage travel! Love it! Marvellous masculine vintage look - those cars are a treat and I love the subtle warmth the red tones add to the neutral palette. It's a great card, Brenda! 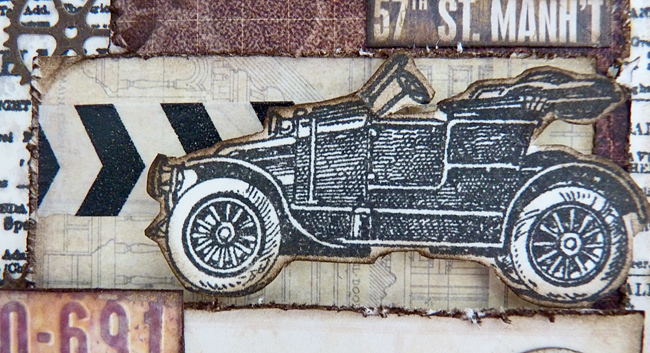 The car stamps are wonderful and I love the layered background. What a great masculine card - love the car images! Whaaattt? You lose your mojo???! I would never guess someone so creative had that happen! (I have been having a major case of the mojo disease myself lately. You certainly have got yours back in full force, and I think it's great you got inspiration from two of your blog buddies! Both are such inspiring artists! I adore the vintage-ness of this card, and your layers are amazing! 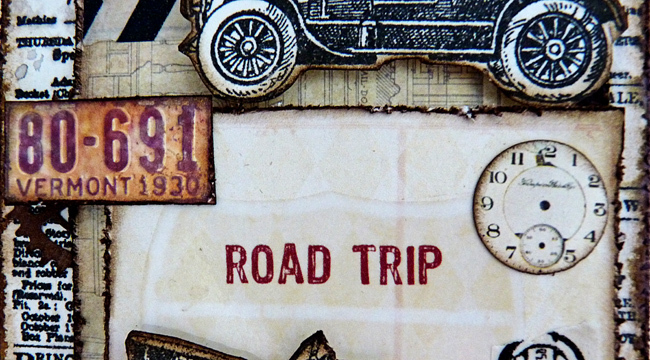 Love those stamped images and your distressing is super yummy! My favorite little detail is the Vermont license plate. Talk about inspiring--THIS is inspiring! Hugs! By the way, your faithful comments on my blog are also SO inspiring! Thank you! Your fabulous card is absolutely filled with delicious vintage appeal. I love the dimensional effect you've achieved here along with all the inking and tiny details that catch the eye and transport you to a long-ago time. You're inspiration comes from two ladies who never fail to inspire me as well. B8t as far as losing your mojo... If this card is any indication then it's been right there with you all along.